If you know anything about the history of Disneyland, you know that Walt used to love spending time with his daughters at Griffith Park in Los Angeles, and it was there that he dreamed of a family park. One without, presumably, litter all over the ground. 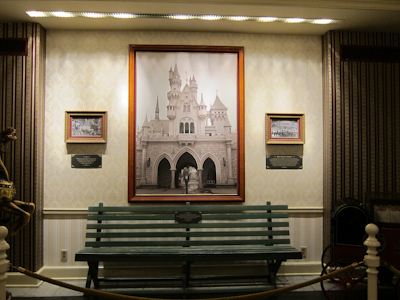 Now over by the Disney Gallery, there’s a bench. Look how nicely displayed it is! Just in case you should doubt its authenticity, there’s the plaque. There’s also a carousel horse from the carousel there, which is where Walt got the idea for King Arthur Carrousel. Except without litter on the ground. 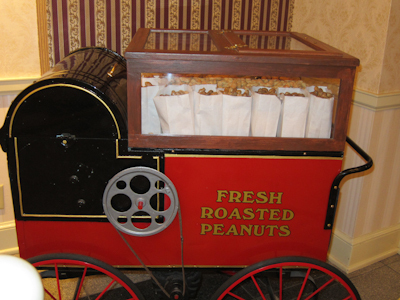 Get yer fresh roasted peanuts! Apparently they used to sell those at Griffith Park. And at first I wondered why they don’t sell them at Disneyland, but I thought well, maybe it’s because they don’t want all of those peanut shells all over their litter-free ground? Main Street griffith park bench disney, where did disney think of disneyland? I enjoy reading your blog. 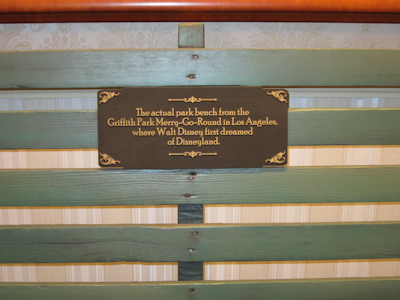 I was excited when I saw this bench when I was at Disneyland last year, having lived close to Griffith Park and taking my kids to the merry-go-round when they were younger. We actually prefer the Griffith Park version for the old-fashioned music and slightly more leisurely pace of the ride. The Griffith Park merry-go-round isn’t in the best physical condition (although one of the stationary seats has been nicely refurbished). It’s too bad that Disney couldn’t donate a few thousand dollars to get the merry-go-round in better condition–they definitely have the funds to do it. The Disneyland connection is noted in a plaque inside the merry-go-round and in souvenirs sold there.